It’s been dubbed the world’s greatest license plate. First appearing on the Internet several years ago (first issued in 2004), it’s a Virginia license plate bearing the message EATTHE. Just under EATTHE is the charity name Kids First. Put it together, it reads Eat The Kids First. Talk about brilliant vanity plates! 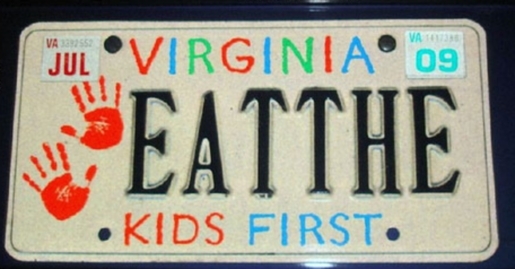 Well, it’s taken the better part of a decade, but the Commonwealth of Virginia has revoked the hilarious joke pro-cannibalism license plate EATTHE Kids First. Well, on the plus side, at least the hilarious vanity plate has gotten the driver lots of positive attention, rather than mistaken tickets. Plus, consider the fact that 13 DMV officials gathered together in a round-table committee meeting just to study this one person’s license plate to determine its legality. That in and of itself is quite an achievement, as you rarely get groups of public officials together in such a large group at one time (unless there’s free food). It’s a shame to lose the license plate, but the infamy will live on forever, no? At least you can take pride in the fact that your license was a viral sensation before anyone knew what viral sensations were!